Borderlinx | Buy Go British and ship worldwide with Borderlinx. Cheap rates guaranteed. Go British: find British luxury gifts for all occasions. 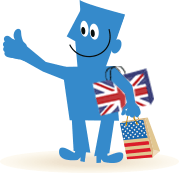 Go-British is an UK online shop selling the best of British designer accessories. Go-British is also a portal to learn many aspects of British lifestyle, its customs, history and the brands. Go-British is a port of call for British luxury gifts for women and gentlemen.